Most of this week was spent trying to get a working Mac OSX copy and removing the Bass sound engine (again!). Bass is definitely out of the project now. For the life of me, I cannot get it to work with Mono on a Mac machine and after nearly a month of no real help from the developers, I've given up on it. This does mean that music playback from the original CD-ROM is gone until I can whip up something else. I'll post about the new solution in the future and put the code up for others in the same boat. 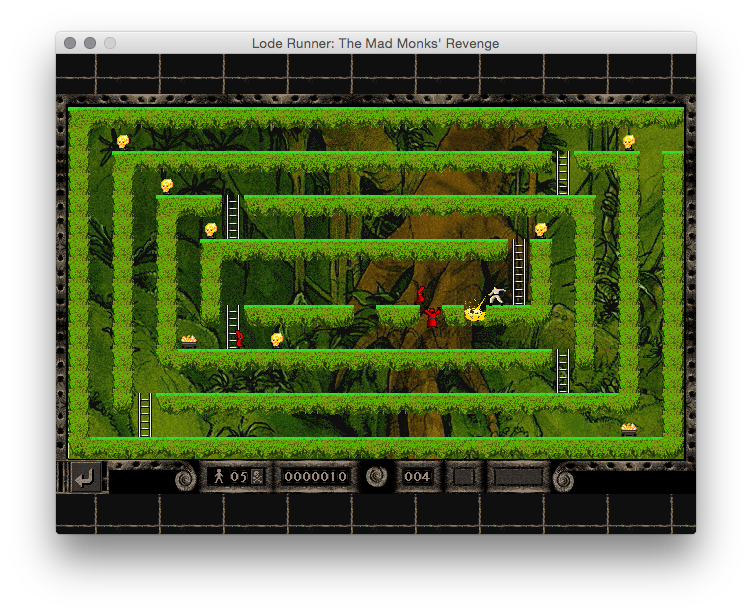 As you can see below, once Bass was gone and some other missing bits added, we now have Lode Runner: The Mad Monks' Rewrite running perfectly on an OS X Yosemite laptop! Head on over to the downloads page and give either the Windows or Mac copies a go.